The 12-month map (below) indicates a forecast of exceptional deficits in the southwest tip of Western Australia and along the southern coast from South Australia through Victoria and into Tasmania. Moderate to extreme deficits are forecast for eastern Tasmania, New South Wales, inland Victoria, and New Caledonia. Primarily moderate deficits are expected in southwestern Queensland and north-central Western Australia. Some mild surpluses are forecast in Northern Territory east of the Victoria River. 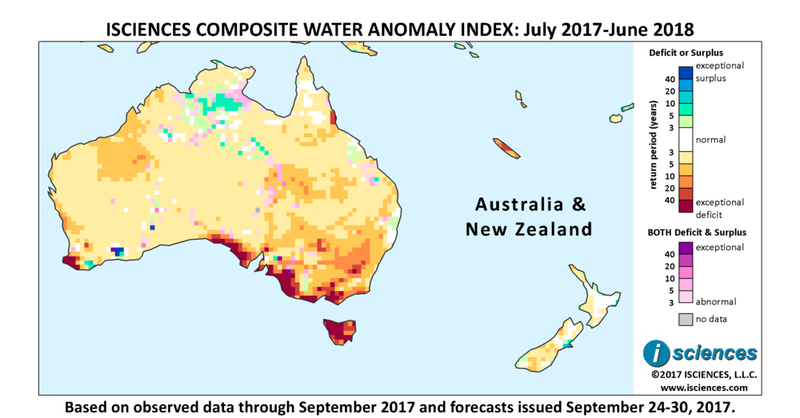 Conditions have been exacerbated by the continuation of exceptionally warm temperatures into September, elevating fire risk from Western Australia to Tasmania. In Queensland the bushfire season is running about 80 percent worse than last year. Across the Tasman Sea in New Zealand, a wet winter has damaged potato crops, raising potato prices 130 percent this August over last year and creating a potato chip shortage referred to as the “chipocaplypse.” Wet conditions caused the winter potato crop to rot in the ground before harvest and also delayed new season planting. Impacts aren’t restricted to potato farms. By mid-September the dairy farming region of the northwest had exceeded its annual average rainfall, raising concerns that saturated pastures with reduced nutrient levels could limit livestock conception. The persistent wet weather, as well as a labor shortage, has also contributed to a 30 percent drop in the number of farm properties sold compared to this time last year, with sellers reluctant to show soggy farms, buyers reluctant to view them, and laborers reluctant to work in them. New research suggests that drought, not dingoes or Aborigines, caused the disappearance of the Tasmanian tiger from mainland Australia 3,000 years ago. Though extinct on the mainland, the last of the species survived until 1936 at the Hobart, Tasmania zoo. Researchers from the University of Adelaide's Australian Centre for Ancient DNA used DNA from fossil bones to track population sizes through time, concluding that the mainland extinction was rapid and that a concurrent population crash, short of extinction, occurred in Tasmania. The 3-month maps (below) for the same 12-month period show the evolving conditions. As is apparent in the time series, exceptional deficits observed in recent months over much of Australia are forecast to diminish considerably in the near-term and through June 2018. Through December, however, exceptional deficits remain in the forecast for much of Tasmania, the southwest tip of Western Australia, and along a stretch of coast in northwestern WA near Cape Range. Moderate to extreme deficits are forecast from Adelaide through Victoria and into the eastern Murray-Darling Basin in New South Wales. Primarily moderate deficits are expected in New Caledonia and South Island, New Zealand. Surpluses ranging from moderate to extreme are forecast for the Ord River Basin of Western Australia and Northern Territory; in northeastern Queensland surrounding Moranbah and also south of Rockhampton; and, Christchurch, New Zealand. From January through March exceptional deficits are expected to persist in Busselton, WA. Exceptional deficits in Tasmania will nearly disappear but moderate to severe deficits will continue to emerge. Deficits in southeastern Australia will downgrade to primarily moderate, with some severe deficits along Victoria’s coast. Aforementioned surpluses in the Ord River Basin will nearly disappear, but some moderate surpluses will emerge farther east surrounding Daly Waters, Northern Territory. The forecast for the final months, April through June, indicates that deficits will diminish in Western Australia’s southwestern tip, Tasmania, Victoria, and New South Wales.